The Cameo Hole in the Wall fireplace boasts a traditional round design built out of light cream marble which is receded into the wall of a normal chimney breast. It fits comfortably into rooms of all sizes with a subdued and tasteful appearance. The style of this fireplace enhances the natural appearance of a classically decorated room by adding to the decor without distracting from it. Though lacking a mantle shelf the Cameo Hole in the Wall boasts the usual range of features associated with a larger fireplace. The Cameo Hole in the Wall is made out of the highest quality marble and will maintain its appearance for many years. 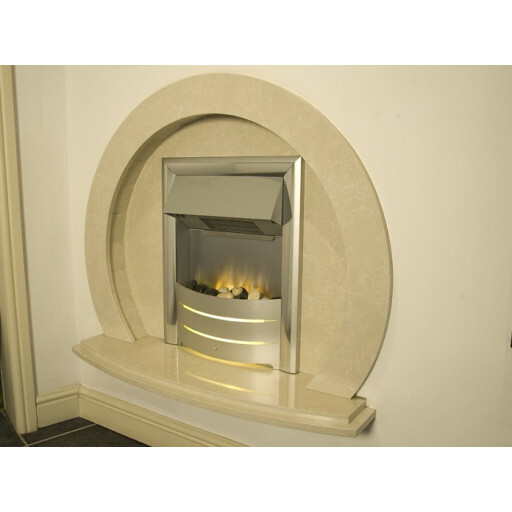 It is also available in limestone and can be set up as a floor mounted fireplace if desired. This fireplace has an elegant beauty that truly shines when the fire is lit. The Cameo will give your room the outstanding finishing touch you've been searching for.